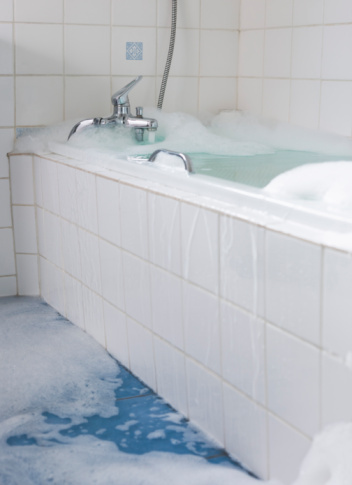 A bathtub, full of water with an occupant, can be one of the heaviest things in the house. For this reason the tub may require additional support, especially for upper tubs placed on flowers above ground level in the home. The weight of the tub, the water capacity and the weight of the occupant are all factors in the total weight of a full bathtub. Bathtubs, plus the water and occupant, can weigh over 1,000 pounds. The total weight of a large cast iron bathtub, full of water with an adult bather, can exceed 1,000 pounds. A 5-foot-long-by-2-foot-wide tub is supported by four or five floor joists if it sits perpendicular to the joists, and two joists if it sits in the same direction of the joists. For this reason the joists under the bathtub may be reinforced especially in installations that utilize cast iron or whirlpool tubs. Bathtubs range in weight from about 60 or 70 pounds for a fiberglass tub up to 500 pounds for a cast iron whirlpool tub. Cast iron tubs are more durable with a longer lasting finish than fiberglass. Fiberglass feels warmer to the touch when you first add water and does not cool the water the way iron may. Water weighs 8.3 lbs. per gallon. That is one of the constants in this calculation. Tub capacity ranges from 20 to 80 gallons per tub full. A 20-gallon tub weighs about 170 pounds full of water while the bigger tubs contain close to 650 lbs. of water. Along with the weight of the water, the cost of water and energy to heat the water should be considered. A smaller fiberglass bathtub may have a total full weight of about 220 lbs. With a 200-lb. occupant, the total weight is about 420 lbs. Spread over the 10 sq. ft. the bathtub covers, this is a load of about 40 lbs. per sq. ft., or actually less than the load of a person standing upright in the bathroom. A cast iron tub with a full load of water and a 200-lb. occupant can total 1,200 lbs. This weight is spread over roughly over the same 10 sq. ft., creating a load of 120 lbs. per sq. ft. or three times the load of the smaller tub.